With the female cricketers competing well in the local and international scene, the emphasis from this year will be to promote them at the Observer Mobitel schools cricketer contest. This will create an ideal platform for both the male and female cricketers to perform and enhance their standard to national level. Another former Observer-Mobitel Schoolboy Cricketer Kusal Mendis almost came up with a match winning performance as he has done on many occasions before. He was on the way to score a well deserved century and victory for Sri Lanka if not for that silly running between the wickets. He ran the first run too slow to start with and the England stumper noted that and pointed to the fielder to throw at the further end. For Mendis’ bad luck, the ball hit the wicket with a direct throw by Leach. Entries are rolling into Lake House office in support of their most popular cricketer’s names in it. Interestingly, entries have also been received with schoolgirl cricketers names in it. Results will be published from next week onwards and the names of leading cricketers will also be known to the readers. What the voters should take note of is that the schoolboy cricket contest if for all three divisions while the schoolgirl contest is an all-island affair without any divisions for voting. 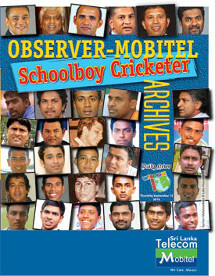 Last year’s Sunday Observer Mobitel Schoolboy Cricketer of the Year Hasitha Boyagoda was a cricketer of par excellence. The 41st Mobitel Sunday Observer School Cricketer contest was launched on Friday with the participation of the chairman of Lake House Wasanthapriya Ramanayake and Mobitel Telecom’s operational head Nalin de Silva. This year the event reaches a new phase with the entry of schoolgirls to vie for awards along with the boys for awards ranging from best bowler, batter and fielder to the most outstanding players in addition to group and team awards as in past years. Sri Lanka Under-19 cricketer and record breaker Hasitha Boyagoda became the Sunday Observer Mobitel Schoolboy Cricketer of the Year last week which made his school Trinity College, parents and Kandy proud. Boyagoda was an expert at bagging prizes but was somewhat of an obscure cricketer who won many trophies and stormed into the limelight when he hammered a world record innings of 191 in the 2018 Youth World Cup in Christchurch, New Zealand against Kenya. Prior to the epic feat Boyagoda was discarded for matches against Pakistan and Afghanistan and Sri Lanka went on to beat Kenya and win the Plate trophy. He is the only Sri Lankan Under-19 cricketer to score two centuries in a World Cup when he made 191 against Kenya and 116 versus the West Indies. Chief Executive Officer of the Sri Lanka Telecom Mobitel, Nalin Perera said the Observer Schoolboy Cricketer of the Year mega awards ceremony has remained one of the most looked forward to events in the local sports calendar for the past four decades that has helped produce some of the most celebrated Sri Lanka cricketers since 1978. Perera, a veteran in Sri Lanka’s mobile communication industry and playing a leading role since its introduction to the country, has also been a great promoter of sports. Former Sri Lanka cricket captain and present chief ICC Match Referee Ranjan Madugalle who was the first recipient of the prestigious Observer Schoolboy Cricketer of the Year award in 1979 and 40 years later the chief guest at the 40th Observer/Mobitel Schoolboy Cricketer of the Year awards night held at Hilton Colombo on Tuesday passed on some key messages to three important stake holders who were present at the occasion.